Is it normal for a Pole to take a motorcycle specifically to England for its debut? Is it normal that twenty guys and girls set off on a journey from Lubsko, Poland to London, to see a motorcycle that had stood in their neighbour’s garage only the day before? Is it normal to take the time off work when the boss says you can’t, but you do it anyway? No, it is not normal, you have to be mad to do such a thing in this current economic climate when jobs are so precious, but that’s what happened, and I was privileged to be able to catch up with these not-so-normal guys and girls during their UK visit. 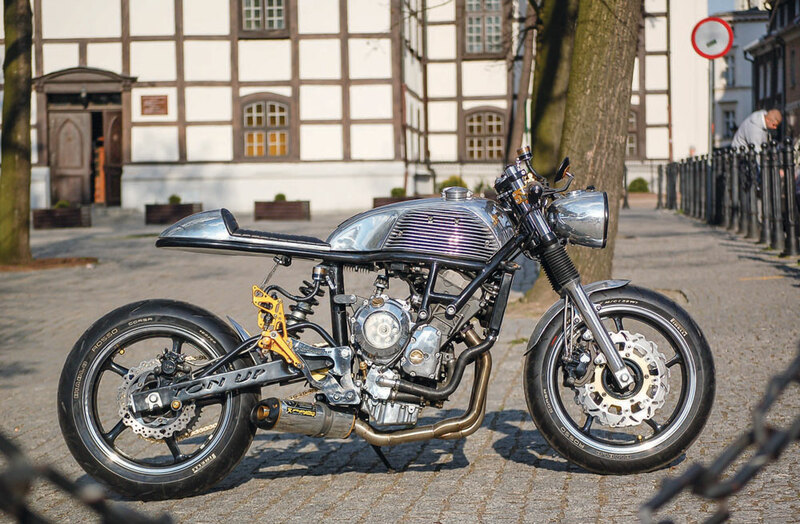 “Comar” is the name given to this very unusual cafe racer built by Arkadiusz ‘Szajba’ Pawlukowicz, whose love affair with mo-torcycles and speed goes way back to his childhood. Since 2006, he has been taking part in quarter-mile drag races at the famous Santa Pod Raceway in Northampstonshire, UK, once having tested a highly tuned turbo-charged Hayabusa, and setting an unofficial speed record of 309km/h. Five years ago he also established his own business, Szajba’s Garage. 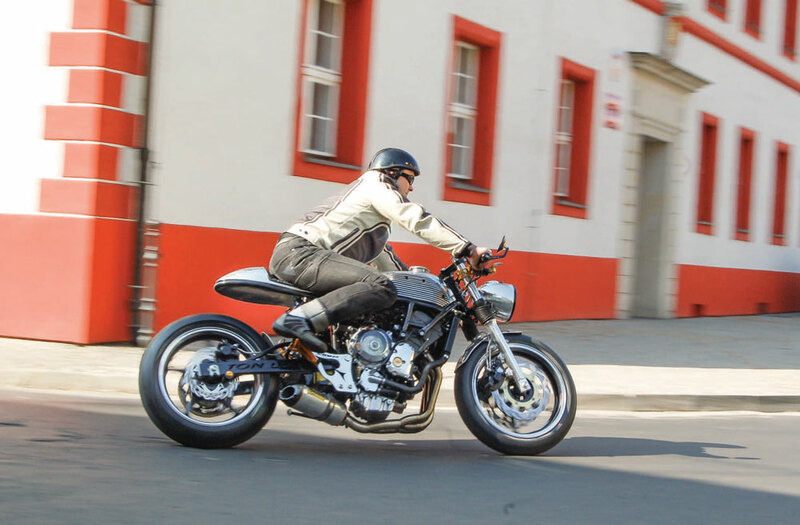 Before the cafe racer project began, Arkadiusz says, he had spent a long time getting into the right frame of mind in differ-ent ways, including looking through hundreds of photographs of original bikes from the Ton Up era, as well as listening to rock n’ roll music from the same period in his workshop. 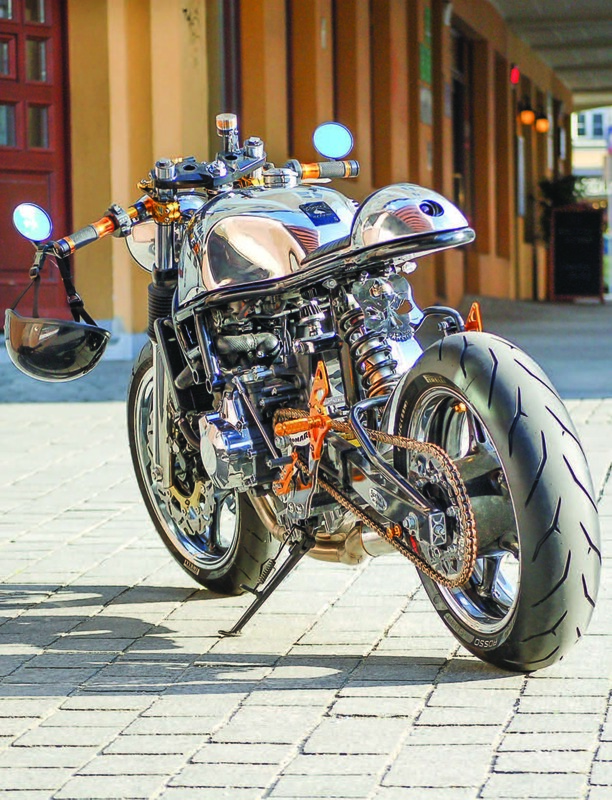 Grad-ually, an idea began to take shape: to create a motorcycle that looked the part, but with a hi-tech engine and accessories. 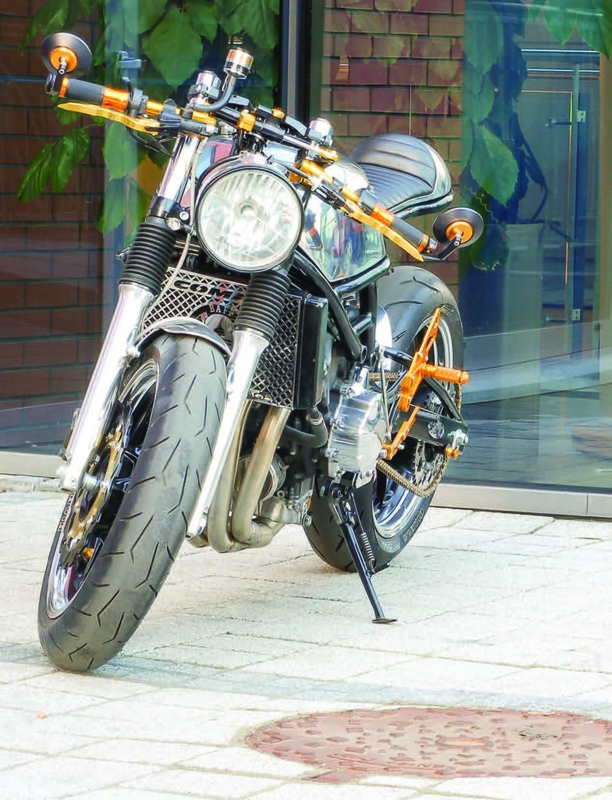 Listening to the group bantering, it became apparent that a few were somewhat aghast when they heard that the donor bike was to be a 2010 Yamaha XJ6, but apart from the engine, practically everything else was discarded. When you look at this custom special, the most surprising aspect is the differ-ence between each side. In effect, it has two faces: the left-hand side of the tank has a plain-polished aluminum finish based on a classic cafe racer from yesteryear, while the right-hand side is enhanced by mock cooling fins which run hori-zontally from the front of the fuel tank, and which together with a clear clutch cover and short muffler, gives the impres-sion of a modern streetfighter. “Once friends saw photographs of the finished project, they were happy to acknowledge that my efforts had paid off, but being the type of person that I am, it was still not enough. I wanted to show it off to the world for the first time at the Ace Cafe, which we all contemplated was both a brilliant and risky idea given that cafe racers were born in the UK. We took our courage in both hands and contacted the cafe, who were delighted and said that we would be very welcome to showcase the bike, and so it was arranged. Comar was given pride of place on the Ace stage and re-ceived a great reception,” said Arkadiusz. The transformation of the XJ6 into Comar included the building of a new stronger and stiffer frame, which whilst re-taining the factory geometry, uses the almost stock XJ 600 engine as a stressed member such that, together with the standard XJ6 front forks, rear suspension, wheels and the ever so slightly modified swingarm, the bikes profile and handling is entirely cafe racer. Reducing the weight of the XJ by 90 lbs involved not only the new frame, but also the binning of a lot of factory parts, with the exhaust being replaced by a four-into-one system from Two Brothers, and clip-ons and rear-sets by O24. Having dis-carded all plastic, including the airbox, the bike was breathing far more freely. With the fuel injector bellmouths fitted with K&N filters, it produces just short of 77bhp, which is very useful when harnessed to the specially-machined, 16-tooth front and 50-tooth rear sprockets. Power is then passed onto the ground via 17” of Pirelli Diablo Rosso rubber at 160 x 60, all being tamed and controlled by stock XJ brakes, with a K4 GSX-R reservoir from Suzuki. Special racing discs and a steering damper from O24 helps look after the 17” of up front Pirelli. “The bike escapes all attempts to label it, and I am attracted by its smooth, cold looking shell. The colour and shape remind me of a large droplet of mercury,” said Arkadiusz. The trip to England was not without some anecdotal mo-ments. Their first confrontation with a native motorcyclist oc-curred much earlier than they expected, in the form of two policemen. Poor GPS navigation had directed them right into the centre of London. “As they leaned against their motorcycles, the sight of our con-fusion brought on energetic gestures, commanding us to pull over so that they could ask questions. ‘Pol-ish? You have motorcycles in the van, do you have any documents?’ It was obvious that they thought the bikes were stolen and the look on their faces indicated that we could be in serious trouble. In a very cold tone we were asked to open the van and to prepare documents for inspection, but when they saw Comar sitting next to an-other bike we had brought along, a street-fighter named Cedzior, they stopped in mid-sentence and called me over. All I showed them was my business card, and magically we were sent on our way. It was the first sign that Comar was able to con-quer the heart of an Englishman!” said Arka-diusz with a grin from ear to ear. With thanks to Wojtek Kopczynski & Janusz Glapa for their assistance with this article.